Gautrain users in Gauteng have a new friend in the form of the GauRider app which gives you quick, real time information about the next Gautrain or bus time. Litha Soyizwapi, an independent iOS developer and designer based in Johannesburg, launched the app earlier this month and two weeks after, it was still ranked in the top five apps in SA. Not too shabby for an app that costs R32,99. 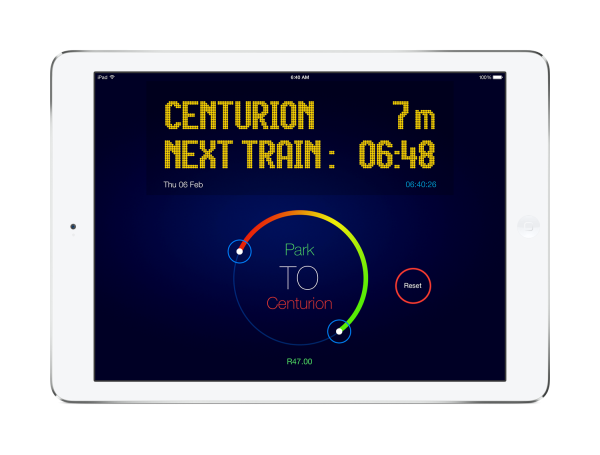 The GauRider has been described as a world-class app that lets you find the next Gautrain and bus times quicker and more elegantly on any of the iOS devices like iPhone, iPad and iPod Touch. GauRider is available on iTunes and is the first universal Gautrain app running on iOS 7, Apple’s latest mobile operating system. Litha says he is looking at introducing it to other platforms like Android as well. The app answers the question, "What is the next Gautrain or bus time, right now?," says Litha, a self-taught developer and graphic designer. It also gives you the cost of the fare. Litha worked on the app for more than a year and is extremely proud of his hard work and effort. The app has been getting lots of favourable responses from users.